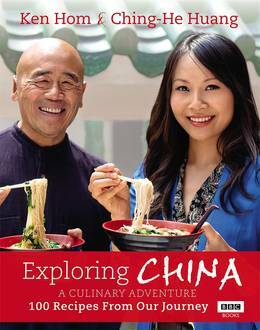 Spicy Sichuan seabass from Ching He Huang and Ken Hom. 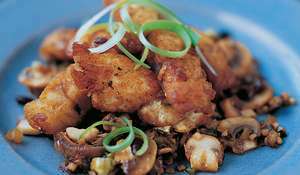 This recipe combines meat and fish to create a smoky but piquant Chinese dish for a main meal. 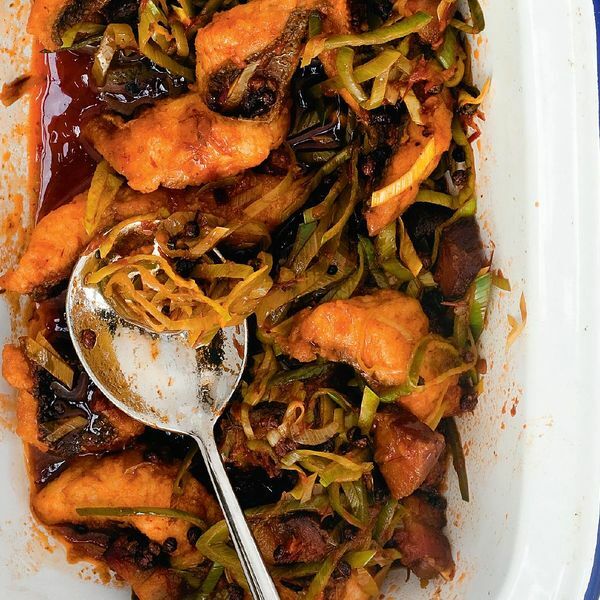 I love combining meat and fish – as used in many Chinese dishes – but this meat and fish pairing is made more delicious by adding strong Sichuan flavours. 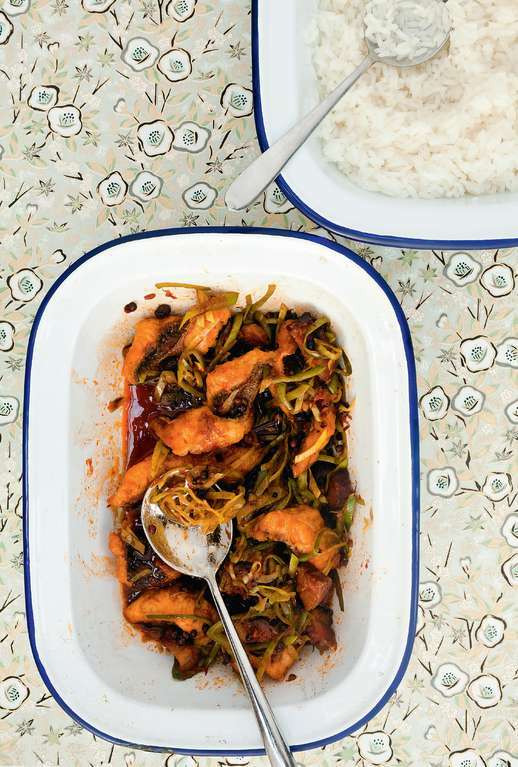 Sea bass fillets are first shallow-fried in oil and then ‘wokked’ with a fragrant spiced oil of Sichuan chillies, Sichuan peppercorns and smoky bacon lardons, then seasoned with chilli bean paste, black rice vinegar and chilli oil – all tossed with delicious Chinese chives. This is a spicy, salty, numbing, rich dish that is full of flavour and best served with jasmine rice and iced cold beer. Put the salt, white pepper and cornflour into a bowl. Add the sea bass and toss well to coat the fish in the mixture. Fill a wok to quarter full with vegetable oil and heat the oil to 180°C/350°F, or until a cube of bread turns golden brown in 15 seconds. Lower the fish pieces into the wok and swirl in the hot oil (the Chinese call this ‘passing it through the oil’) for 1 minute. 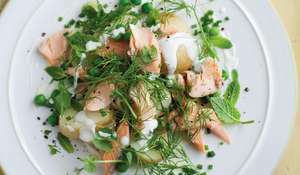 Pour the fish into a strainer over a heatproof bowl. Return 1 tablespoon of the oil to the wok and reheat. 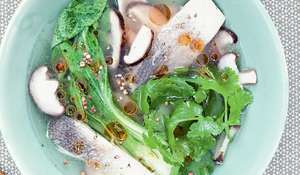 (The remaining oil can be reused for another fish dish at a later date.) 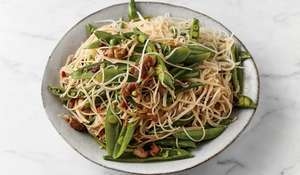 Add the dried chillies, Sichuan peppercorns and lardons and stir-fry in the hot oil for less than 1 minute to release their flavours (the Chinese call this baosiung – ‘explode fragrants’).Add the chilli bean paste, then tip in the Chinese chives (or baby leeks) and toss well. Add the vegetable stock (or water) to help the chives cook and keep tossing all the ingredients together. When the chives are a deep, translucent green and have wilted, return the fish fillets to the wok and toss together, being careful not to break up the fish. 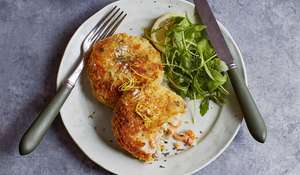 Season with the vinegar and a drizzle of chilli oil, transfer to a serving plate and serve immediately, with jasmine rice.